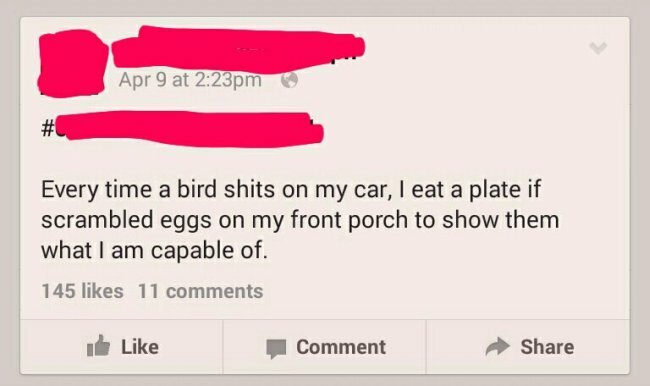 These Hilarious Facebook Statuses Will Make You Laugh Like Crazy! I have for you below a collection of what might be the best and funniest Facebook statues that were ever written. No matter if the intention was, from start, for the status to be hilarious or it became because of an accident or a smart comeback, the truth is that all the 22 Facebook status messages below are pure genius and they’ll make you laugh really hard. I know I laughed to tears going through the messages over and over again and every time I read the list I find a new favorite. So let’s not waste any time and let’s check out below the funniest Facebook statuses ever! Do you find these funny? Share the love by sharing this article with your friends, then! Previous PostRyan Reynolds' Tweets Are Insanely Fun to Read Next PostThese Well Known Logos Are Updated to with Brutally Honest Slogans. You Will Laugh Hard!